Pasta is a dish loved by many, but it is carb heavy. Just swapping it for Wholemeal makes the meal far more nutritious, with all that added fibre. That makes this chicken and goat's cheese pasta both healthy and delicious. For this dish I used damson ketchup from an independent artisan. If you can't find anything similar, you can substitute with some damsons jam and a bit of vinegar. Boil the spaghetti for ten minutes and then drain. Finely chop (or use a food processor) the onion, sweet potato, and garlic. 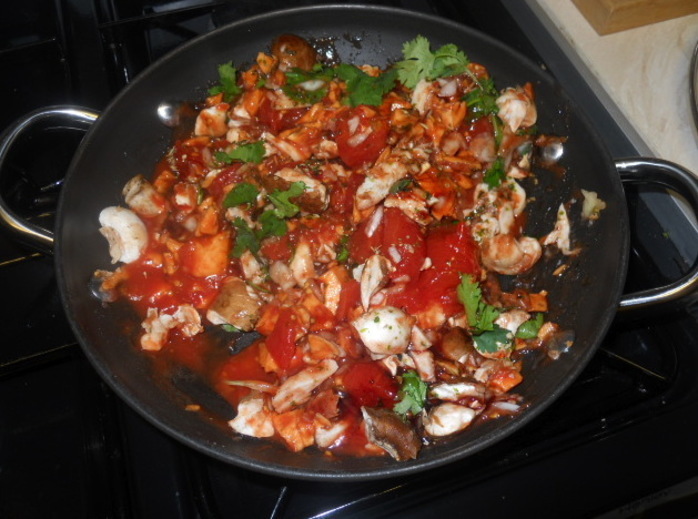 Mix together the tinned tomatoes, mushrooms, chicken, onion, garlic, sweet potato, herbs, spices, and damson ketchup. Heat in a saucepan for a few minutes, the stir into the spaghetti. Stir in the goat's cheese and parmesan.